The more complex the project, the earlier implementation conversations need to happen. 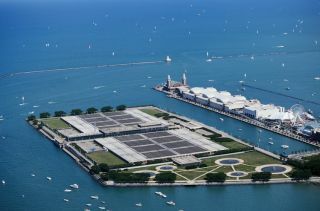 The Jardine Water Filtration Plant (Chicago, IL) is a perfect example. The Jardine Plant opened in 1968 and purifies water drawn from Lake Michigan for Chicago and surrounding area residents. It is the largest capacity water filtration plant in the world, producing nearly 1 billion gallons of water per day (or 1 million gallons of water per minute). The audio system, needed for both the fire alarm/emergency and chlorine leak alarm notifications and general announcements, required an upgrade in order to meet standards and growing needs. Interstate Electronics, the project integrator, participated in multiple in-depth brainstorming conversations with Biamp early in the project specification and installation. The key benefit of having these conversations with Biamp is that it allows us to have thoughtful, exploratory conversations around what the end user requires and wants (often these are two different lists), what the best audio solution would be, and most importantly how to design the system efficiently and effectively. The audio solution identified was Biamp’s Vocia platform, providing zoned paging across 54 different zones (plus one emergency zone). The Vocia system also provided integration with the emergency system, enabling alarms indication and notification for both the fire and chemical alarms (e.g. chlorine notifications). It also interfaced to existing non-emergency systems and utilized the VoIP system for paging. Being able to brainstorm on what was needed and how it could be implemented allowed for the opportunity to look at the end user’s needs from several different angles; ultimately arriving at the best, most efficient solution for the customer. Remember, your manufacturer is more than a maker of the audio equipment. They are your solutions partner and will provide a level of expertise as well as a new way of looking at things that you may not have considered. During our retrofit installation at the Wisconsin Center Convention Center, we started to experience some hiccups in the system where shortly after we would push the SymNet Composer site file into the 16 SymNet Radius 12x8 DSPs and the nine SymNet xIn 12s, Dante flows were not always syncing up—and were consequently corrupting the file, causing constant white noise to come through the loudspeakers in a few of the rooms. During commissioning, we had experienced this occurrence three times, always right after a file push. We eventually had the opportunity to experience this issue whilst the Symetrix technical support group was in their offices. Ryan Curtright, our primary support engineer for many years, brought us onto a joint PC sharing website to allow him to see what was happening. Normally, we would just do a hard reboot to the system, which offered an instant fix — although not a long term solution. Ryan had one of the Symetrix engineering team join the session which allowed them to look inside the DSPs and find the culprit — all the way down to the 0s and 1s of the software programming. And while they did discover the issue, the important question was why the problem was happening in the first place. Eventually, the why was shown as an error we were making in not having all of our firewalls off on the Host PC that the facility provided. And on occasion the firewall would “jumble” the data packets and cause some parts of the site to go a bit ‘off kilter’. We got it fixed and were able to push the site file safely and successfully back in to the system. However, the owners were quite concerned and asked how to fix this should it happen again when we were not able to get to them instantly. Ryan at Symetrix put some thought into our programming work and came back with a very unique (and a first of its kind for Symetrix) solution—a global file reset ‘button’. The ‘button’ completely resets and re-syncs each processor within 1.5 seconds. This completely set our client’s mind at ease. Symetrix technical support has always been there for us to help us serve our clients. To keep up with its commitment to customer satisfaction, Crestron created a dedicated hotline, Customer Satisfaction, where end users (homeowners, corporate customers, and more) can call or email us to either ask questions about how to use their system, or describe problems or issues they’re having. Trained professionals gather all of the information and contacts, and create a case file for them, then our team reviews the incident and connects the customer with the integrator to collaborate and resolve any issue. Crestron’s technology is supposed to enhance the way people work and live. Recently, we had an instance in which a customer wasn’t happy with how his system was functioning. He couldn’t get his music library to play, so he never used it. Instead, he used his iPod and attached it to speakers. The customer’s colleague was working with Crestron on his project and encouraged him to reach out to Crestron to voice his concern about the system. Soon after, Crestron Technical Support was notified, and a case was opened. Crestron sent a Technical Support team member on site to assess the customer’s issue–the system wasn’t programmed correctly, and the equipment that was installed wasn’t working properly. Plus, the customer wanted to make upgrades to his system. We invited the customer back to our NJ Headquarters, and presented the customer with a demonstration of what the new system could be like. The customer loved the system and decided to go with it. The combination of personal, technical support and the path to upgrade, including dealer discounts (Crestron has several Upgrade Program incentives), helped to not only change the customer’s perception of Crestron, but also to inspire the customer to use Crestron for another project. BNA Consulting’s Jaime Verhaal, right, and Drayton Bailey, left, served as the AV consultants on the Lectrosonics installation Bingham High School in Utah. The school auditorium at Bingham High in South Jordon, UT underwent a substantial upgrade to its sound reinforcement capabilities, utilizing Digital Hybrid Wireless microphone and Aspen audio processing technologies from Lectrosonics. Salt Lake City-based BNA Consulting did the design, with integrator Performance Audio, resulting in a system that facilitates control via an Apple iPad. Prior to the purchase, Scott Woolley, Lectrosonics western regional manager, went to the school and demonstrated the system for the school by pairing it with what they had in place. It worked perfectly, and Verhaal installed a 12-channel system comprised of two Lectrosonics Venue wireless microphone receiver mainframes, each fully stocked with VRS receiver modules, and eight Lectrosonics LMa Digital Hybrid Wireless beltpack transmitters plus four handheld microphones. One of the unique service aspects of this project on behalf of Lectrosonics was that Woolley personally attended a few of the school’s performances in order to observe what the schools actual needs and requirements were. “One of the things I observed was the setup of the band and I realized that the school needed to have a more robust monitoring system,” says Woolley. This led to the school choosing the Lectrosonics Aspen audio management system in order to get the audio back onstage for monitoring. So Bingham High School ended up using Lectrosonics audio processing equipment in addition to the microphones. The audio management system includes a Lectrosonics Aspen SPN2412 24 input / 12 output audio processor and an Aspen SPNDNT (Dante) interface. “The Aspen SPN2412 is set up to handle automixing when the space is rented and to output Dante to a digital mixing console when in manual mixing mode. With the implemented iPad control, the system is it easy to operate unattended, while having full control via the mixing console for larger events,” says Verhaal. I recently had the opportunity to visit an installation in which the company’s RackLink Power Management System was being utilized. The system at this Emergency Operations Center, a federal government install in Kansas City, was in need of some troubleshooting. I immediately identified a switch that has proven difficult when interfacing with AV control systems, including the RackLink system. All it took to fix the problem was implementing a simple firmware update and the system was up and running again without a hitch. My advice to customers is to keep firmware up to date–it’s one of the most important and easiest ways to avoid conflicts and downtime. During that visit, the customer also mentioned that their processor was locking up occasionally (as some have been known to do). I pointed out that RackLink could reboot the processor automatically by using the “Auto Ping” function. The install tech did not know that this was possible and is going to look into changing the design to maximize that feature. Teresa StrongAfter a recent change to Kontour monitor mounts, a customer contacted me and explained that the new model no longer fit the 2” outside diameter poles they have in all their facilities, but they had worked perfectly with the previous version. The customer was looking at having to return 46 mounts and source another manufacturer. I worked with Paul Redding, a sr. strategic account manager, and directly with the distributor to help the customer since the service provider wanted to charge them a 30 percent restock to return the new style mounts. With the help of the distributor, the customer shipped the mounts back to Chief directly. During this time I had been talking with the customer and looking for a solution and to keep them in mounts right away, working with David Albright, Product Manager, Chief was able to make them 46 of the original version so they would not be in a deficit as they update all their facilities. In the meantime, I ordered up a Kontour K1P120B to her desk along with a KSA1017B to see if I could find a way to retrofit the original clamp to the new mount. After searching through the vault, I located the parts I needed to adapt the two products. I’m waiting for a forecast from the customer on how many mounts they will be needing over the next year and then will create a MSP part number for them to order the already configured mounts for their use, and will send out my creation to have them confirm that it is a working solution. In the support industry, a technician can and will see both ends of the spectrum of troubleshooting service calls—and everything in between. I recall one unique instance in which technical support saved a project, and ultimately a head end system, from being pulled from the field. It was my first week as a support technician at North American Cable Equipment, and I was fresh to the industry and still getting my feet wet. A support call bounced around our technical department for about a day until I was brought into the loop. According to the field support staff at the property, all digital HD channels would pixelate and show signs of interference at very specific times of the day. The property’s maintenance staff explained that the pixilation of the HD channels would occur for roughly 30-minute intervals around 10a.m. EST and again at around 7p.m. EST. Property management was becoming increasingly upset with the HD system’s performance, and our support staff was really in a time crunch to come up with a solution. I took the lead on the support for this call and began troubleshooting. Over the course of the next two days, I went through every component of both the head end system and the distribution—testing inputs and outputs of each component, cable and connector integrity, signal strength, TV tuner performance, and every other imaginable aspect of the system that could cause this behavior. To both my and the field technician’s surprise, all components showed top-notch readings. It was at this point I began to work backwards in my mind. As a last-ditch effort, I began asking the most elementary questions regarding the system—the last of which, “Where exactly is the head end system connected to the electrical power?” The field technician then began to describe the conduit box that delivered electricity to the headend. I then asked if any other electrical devices received their power from the same conduit box. “Not now,” the field technician replied, “but several times a day the cleaning staff will plug in vacuums and other cleaning equipment for short periods of time for housekeeping.” Electrical noise was interfering with the RF output of the head end system when sharing a conduit with the cleaning equipment. I had the technician call an electrical engineer, who then verified the site’s electrical grounding and installed a dedicated conduit box for the HD head end equipment only. As luck would have it, I never received another support call from the property, and the head end equipment is still in use over five years later. Jamie FinneganOffering pre- and post-sale technical support for the products and services we provide at Almo Professional AV is certainly not the most glamorous part of the job. However, this is one of the primary ways we differentiate from other distributors. With a specialized fleet of eight business development managers on hand to assist our field sales team, we offer everything from technical knowledge to system design support. Our partners have come to rely on this value-add for requests that range from A-Z. Sometimes these requests are as simple as choosing the right cables for an install and sometimes they can be extremely challenging, like designing an entire system or customizing shipping crates. The possibilities are endless. A recent example pertains to the Barco ClickShare product. While its wireless architecture does offer its own ecosystem that partitions it from a corporate network, it utilizes encrypted Wi-Fi from the buttons to the base station, which share Wi-Fi channels with existing networks. It is critical to perform a Wi-Fi sweep of the environment to ensure optimal performance and the best meeting room collaboration experience. Because of our technical knowledge about ClickShare, Almo has been instrumental as the “first line of defense” in deploying this system smoothly. This sometimes involves going onsite with the dealer to troubleshoot the installation. It’s this “no fear” approach to getting our hands dirty that positions us to understand how ClickShare can be implemented with the greatest success, especially in large, challenging enterprise applications. Last year, someone misled a dealer during the design phase of a new high-tech medical facility that needed to use 4K video technology in an operating room application. The dealer called in to talk with our sales and design team, and we found a major flaw in the wiring and equipment design that would not have supported the customer’s requirements. Fortunately, MRI was able to assist the dealer, adjust the bill of materials, and the wring plan before the installation to deliver a solution that exceeded the customer’s spec. One of the many benefits for integrators working with SYNNEX is the fact that the company also has an expansive IT distribution practice. Integrators that don’t have a solid IT practice depend on SYNNEX’s IT tech support and sales teams to help them win business in technologies beyond AV, like networking, mobility, and cloud computing. Even integrators with strong IT acumen take advantage of SYNNEX's tech support depending on the situation. I received a call to our standard tech support line from an integrator one day telling me he had several Wattbox units in the field that had been dropping off of OvrC (the remote access portal). I did the first thing we always do and logged into my OvrC admin account and checked his activity log. It was more like several hundred Wattbox units that I saw dropping off line. These units were installed in different locations across the country. The one positive for troubleshooting purposes was that each job was identical. The install was with an enterprise-grade router and our Wattbox. The integrator wanted to use OvrC to monitor all of these install locations from one interface easily. My first task was to find a trend in the problem. It seemed every night at 12:00a.m., every Wattbox would show connected to the cloud and at 12:15a.m., they would all disconnect. This symptom was consistent every night. Through some digging and research, we found that there was a recent update to that router. This update was intended to upgrade security practices due to the recent Heartbleed exploit. The router was now using a zone based security system, which had to be causing trouble. An integrator contacted TecNec’s sales team in regards to a snag in a system design concerning how to get 32 channels of zone audio out of an AMX switcher to an alternative facility about 125 feet away. The integrator wanted to do this over fiber, which seemed to be a very expensive and highly technical task. One such instance was with Technical Innovation (TI), which has been a SYNNEX customer since the inception of the company’s Pro AV division five years ago. TI designs and develops enterprise IT solutions with a team of experts, ranging from cloud based video as a service (VaaS) that run over the top to voice, streaming, broadcast, and big data integration. In a recent project for a major U.S. broadcaster, TI’s design team engaged with SYNNEX to leverage the server configuration validation expertise of SYNNEX’s HP dedicated engineers. “SYNNEX has been a trusted partner of TI and is a company TI frequently engages with in solution selling opportunities,” said Andy Jackson, vice president, sales, Technical Innovation’s Broadcast Solutions Group. AVAD LLC recently collaborated with Texas Info Media, an integrator based in Yantis, Texas, on a local digital signage installation that has Steve Fairbanks, president of Texas Info Media, acknowledged the AVAD System Design Group as a contributor to his success in contracting with the Andritz Group, a multinational supplier to the municipal and industrial sectors. “AVAD's design team has been outstanding. When we’re in a position of having to juggle multiple segments of an installation, we can count on them for a good design, materials layout, and a team that acts as an extension of the integrator,” Fairbanks said. Texas Info Media began by assessing Andritz’s needs. As a large facility with multiple buildings, the company needed to display meeting reminders that would present a professional atmosphere to their clients as well as safety reminders that aided employee effectiveness. Beginning with PROconnect media players and signage content powered by RiseVision at the company’s Texas location, AVAD and Texas Info Media specified media players and displays to create the precise atmosphere required. Ease of use was a paramount concern for Andritz, so AVAD System Design Group worked with the integration team to specify and source solutions that could connect lobbies, break rooms, hallways, and work stations with one central hub to make content administration simple. Following the completion of 12 locations throughout the United States, Fairbanks will be in talks with Andritz to work on its European and Canadian locations as well. We were not able to immediately see the router as a problem, so the integrator gave me unattended access to a computer that was in a test environment. Using a remote access tool and Wireshark I was able to capture plenty of information on how, when, and where the drop in communication was occurring. After doing some research into the router and its settings, we were able to come up with a potential solution. Through some collaboration with other departments, we determined that our Wattbox address was not sitting in the proper security zone on the router. The Wattbox was on a static address, and after 15 minutes of requesting an address to distribute, the router quit looking for it and no longer saw it as a safe device. It then quit allowing communication between it and the router due to it being unsafe. This is what kicked it off of OvrC. The integrator did not want to apply this change globally until he was sure it would work. Network security and stability were extremely important for these jobs. We adjusted how the address of the Wattbox resided in the internet facing zone of the router. Doing this allowed the Wattbox to communicate consistently with OvrC and the router always saw the Wattbox as a safe device. We trialed this on his test environment for a day and everything worked great. We were able to push a global update to the rest of his routers in the field and correct the problem fully. The units have been online for months now and we haven’t received a call back from the integrator since. While the problem took several days to correct, the time was needed to ensure the final fix would be rock solid. This success turned several hundred Wattbox units to several thousand, as this integrator saw these as an extremely fast and convenient solution for remote monitoring with OvrC. Tech support specialist Jules Taylor researched it and realized there was hardly anything on the market that would bring together 32 stereo/64 mono channels of A/D conversion over fiber with limited rack space. He knew the Antelope Audio Orion 32 (although meant for high end recording studios) would be the perfect fit at 32 I/O with optical and copper MADI outputs. Two RU a side would comprise all the A/D and D/A the integrator would need. To his knowledge, the only other alternatives from competing manufacturers would have been double the price tag and about four times the rack space to make that kind of high channel count transmit/receive at 24 bit/96 kHz resolution. Moreover, he didn’t know of any tactical MADI cable manufacturers at the time, but with TecNec’s in house fiber lab, they knew they could handle that task. TecNec actually ended up with the Camplex HF-TS04SCM3-0150, which is now available on its website as a product because of this. In addition to all of the above, TecNec was also able to supply four 32 point RCA feed through panels and 16 custom Mogami 8 pair DB25 to RCA cables to complete the entire system.